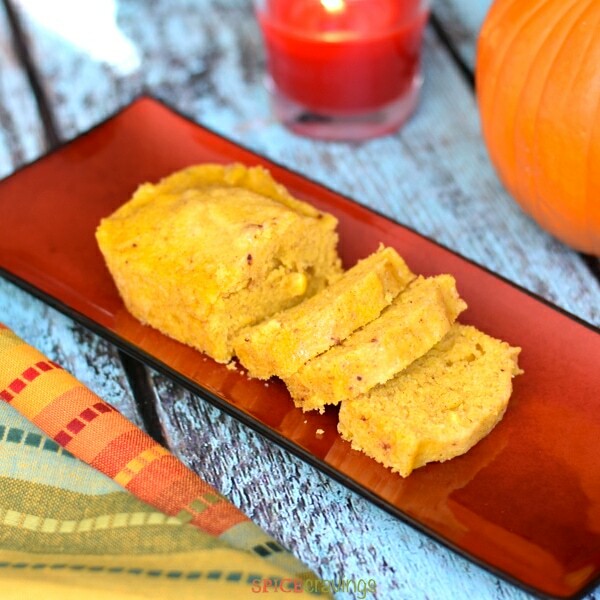 Earthy and sweet cornbread mix meets creamy and moist homemade pumpkin puree! The result is a soft, moist and delicious Pumpkin Spice Cornbread. 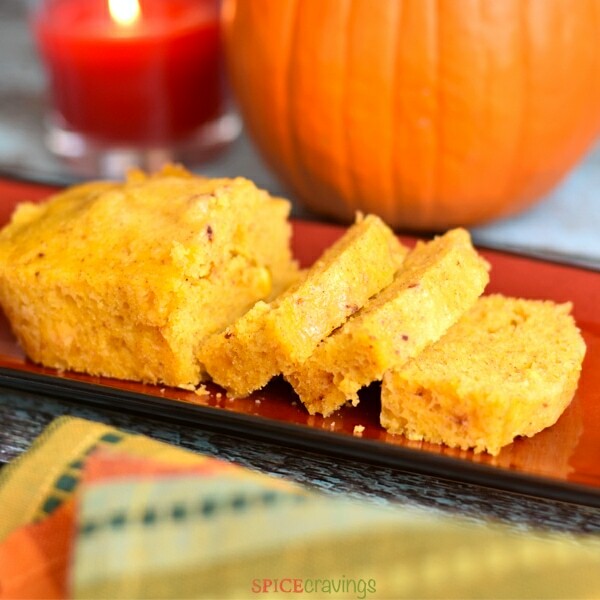 It makes for a great side on its own, this delicious and moist pumpkin spice cornbread and also makes for a great base for stuffing too. Fall is my favorite season of the year. The pleasant breeze, leaves changing color, salads giving way to soups, ice-creams making way for pies and cobblers! It’s also the beginning of Pumpkin season. You can start seeing pumpkins of all shapes and sizes widely available everywhere. 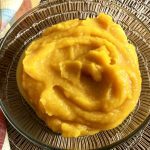 I love cooking and baking with pumpkin and I am always looking for new ways to use pumpkin in sweet and savory dishes. 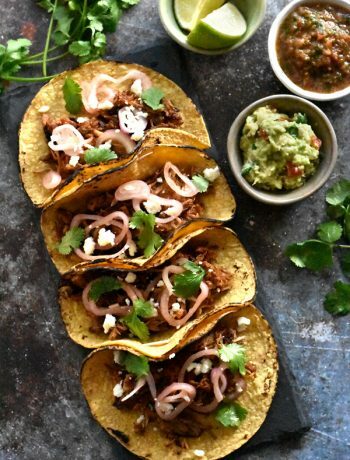 One thing I love doing around holidays is to create recipes that are quick to please and can be made ahead of time. 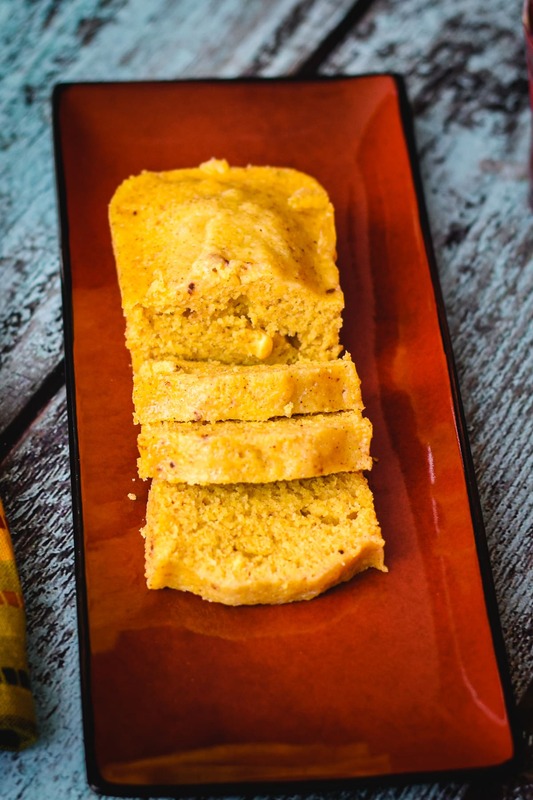 Seems like I’ve hit a home-run in my house with this recipe for Pumpkin Spice Cornbread! This holiday season, I am jazzing up a tried and trusted store-bought cornbread mix from Trader Joe’s, that I have been using for years. This cornbread will make a great addition to your table. Enjoy it as-is or make stuffing with it. 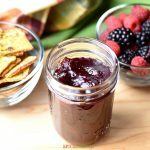 Pair it with honey butter or pumpkin butter and enjoy it with a cup of tea or coffee for a delicious and light snack. It cooked in about the same time as the oven, was missing the crisp golden outer layer. I prefer the portion size of the slices- prevents me from over-indulging 🙂 Plus, makes for cute gifts for the holiday basket. From one 15 oz. box of cornbread mix, I can make four mini loaves. I typically half the mix and make two different flavors out of it. You can use this recipe and make Pumpkin Spice Muffins too, it will be a great side for your breakfast or brunch table. They are perfect for taking to office potlucks too. You can reduce the pressure cooking time to 10 minutes for muffins. How to Make Pumpkin Spice Cornbread in the Oven? These Pumpkin Spice Cornbread loaves can be made in the oven too. 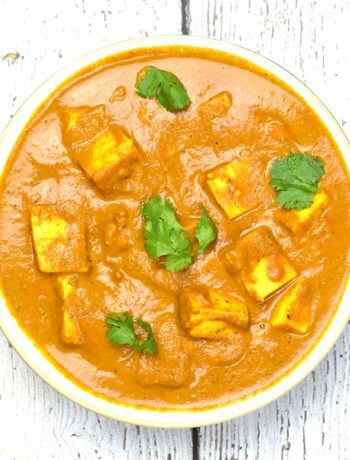 Simply mix everything as per the directions and bake in a preheated 350F oven for 12-14 minutes. The actual time will depend on your oven. At the 12 minute mark, check for doneness by inserting a toothpick, if it comes out clean, you’re good, else, pop-it back for another minute or two. The second flavor I made over the weekend was another huge success in my house is Cranberry Orange Cornbread. 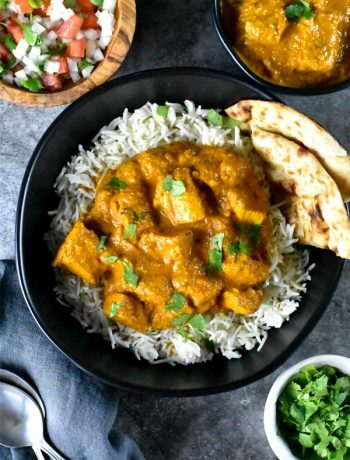 If you want to stick to one flavor, simply double up the ingredients in this recipe. Making cornbread in an instant pot makes it more moist, almost like a sponge cake. 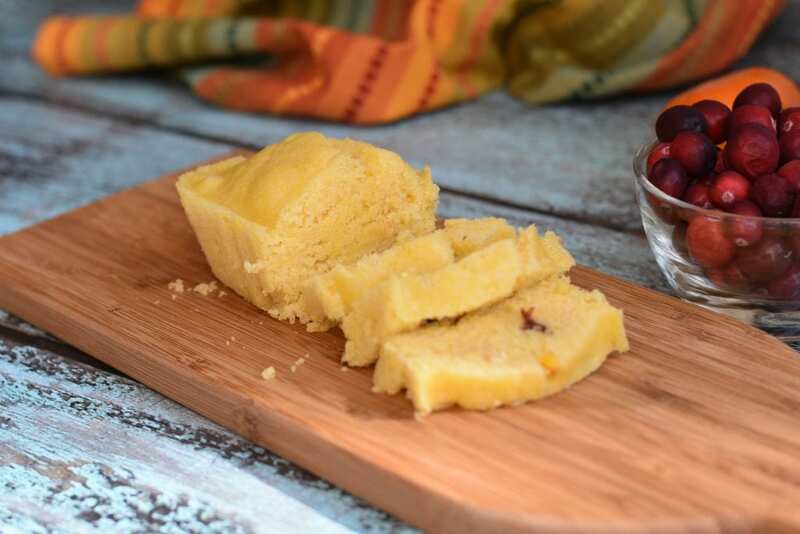 In this recipe, the earthy & sweet cornbread mix meets creamy & moist homemade pumpkin puree- the result is a soft, moist, delicious Pumpkin Spice Cornbread. Melt butter in the microwave, about 20-30 seconds. Add egg, pumpkin puree, milk and pumpkin pie spice. Whisk together. Add cornbread mix and mix with a spatula. Grease mini-baking loaf pans with any baking/cooking spray. Divide the better equally between two Mini Loaf Pans. Pour 1 cup water in the inner pot of your Instant Pot (I used the DUO 6 Qt). Place trivet. Place two loaf pans on top. If you're doubling up the recipe, you can stack two more on top as shown in the video. Close lid. Set valve to Sealing. Press Manual for 12 minutes. Open lid after natural pressure release. Cool cornbread for 5 -10 minutes before slicing. Enjoy with honey butter! Mix all the ingredients as per the directions above and bake in a preheated 350F oven for 12-14 minutes. The actual time will depend on your oven. At the 12 minute mark, check for doneness by inserting a toothpick. If it comes out clean, you’re good, else, pop-it back for another minute or two. Could you post the size of your mini-bread pans? I went to order some from Amazon and found there are various sizes of pans under their mini category. Thanks! Thank you for the reply! We love TJ’s cornbread mix so these variations will be a great. Yes, that’s the size: 6″ X 3.5″ X 2″. I had set up the link for that size, don’t know why it directed you to the other one. Sorry for the confusion. Hope ti works out for you now.